Meanwhile in Africa its rip-offs and resource wars ..
As the world watches and waits for the British company BP to stop the ecological disaster unfolding in the Gulf of Mexico, you would be forgiven for forgetting that elsewhere round the globe the oil industry is just getting on with it. Away from the glare of the cameras, there is the routine business of contracts being signed, wells drilled, and oil found. There is the routine downside to the oil business: the communities and ecosystems which are impacted, and countless other leaks and spills happening that never make the radar of the media. The media has only appetite for one bad news oil story at a time: And at the moment that is BP. But here is another one being perpetrated by other British oil companies: this time in the Congo. Its far less obvious, far less explosive than the Gulf but the situation there is equally as grave, just in different ways. A new report from the oil industry analysts, Platform looks at leaked oil contracts that will be used in this unstable African country. Remember it was Platform that blew the lid on the devious and dirty contracts in Iraq called Production Sharing Contracts (PDAs) that essentially gave much of the power to the international oil companies rather than Iraq. Well the same type of contracts are going to be used in the Democratic Republic of Congo (DRC). Confidential oil contracts held by UK companies Tullow and Heritage in the DRC “reveal the danger of economic rip-off and rights abuses in one of Africa’s most unstable countries”, according to Platform. * Tullow’s contract terms reduce the Congolese take by around 15%, compared to Divine’s. * If recognised, Tullow’s contract will cut Congolese government revenues by over $10 billion – a figure equivalent to the country’s entire national debt. Despite this, Tullow and the British Embassy in Kinshasa have been lobbying hard for these contract terms. This represents a significant transfer of wealth from some of Africa’s poorest to British and Irish investors. Pollute the land, water and air – just what BP is doing in the Gulf of Mexico. Two different stories: same result. Let’s get this straight: Gertler via his compnay Highwinds, purchased Kolwezi from the government for an undisclosed sum, who had seized it from First Quantum who had spent $750m developing it over the previous decade. Gertler then sold it to Eurasian Natural Resource Corp, of Kazazstan for $175m. This raises the question of who on the inside, is benefiting from these deals? 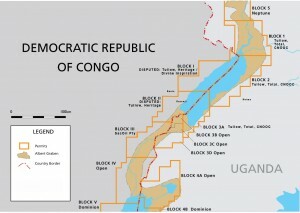 The sale to Eurasian is well below real value, probably reflecting the risk over purchasing an asset whose ownership is disputed (First Quantum is in international arbitration over the Kolwezi expropriation, together with the Word Bank’s IFC, whose presence in the project as an equity investor a decade ago was supposed to lower risk and increase the attractiveness of the DRC as an investment destination). The govt evidently decided that it was worth it to shred its credibility as a place to do business, becauase in the short term regime insiders could make enough off the looting of First Quantum’s mines). Who, exactly, is benefiting, Kasonga, Kabila et al? What an awful mess. Just interested to find out the motivations and interests involved, from anyone in the know.